Londoners, famous for remaining calm in the face of danger in the blitz of World War II and through a long campaign of IRA bombings, saw the worst terrorist attack on their city a little more than a decade ago when suicide bombers attacked the Underground. Four assailants detonated backpacks filled with explosives on London’s public transportation in 2005, killing 52 people. Three of the men blew themselves up on the London Underground and one on a double-decker bus during the morning rush hour of July 7. About 700 people were injured. The four men were linked to al Qaeda and one, Mohammad Sidique Khan, claimed in a videotape released after the attack that the British public's support for governments that "perpetuate atrocities" against the Muslim world was to blame. Osama bin Laden's second-in-command, Ayman al-Zawahiri, praised the bombings. 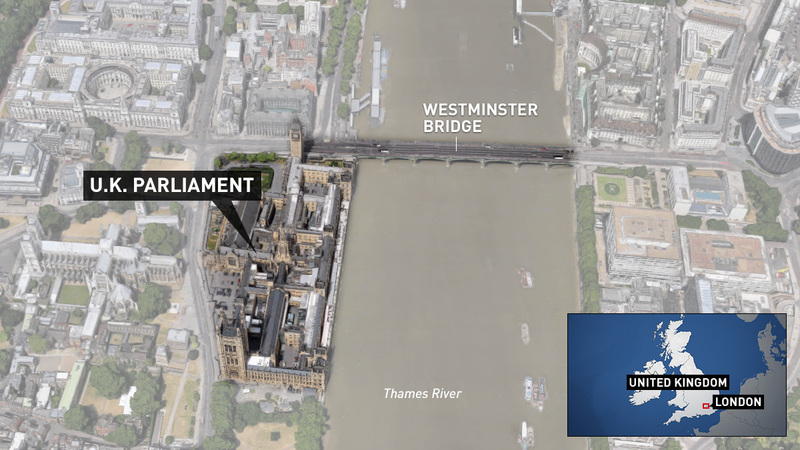 The latest attack in the city came Wednesday right in its heart, yards from Big Ben. 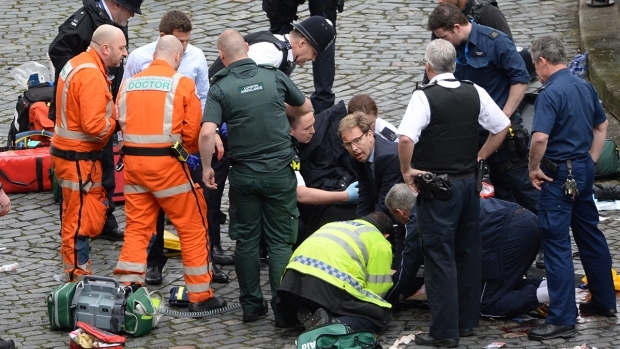 Three people were killed when the assailant drove his SUV into pedestrians on Westminster Bridge and then stabbed a police officer to death at the British Parliament. At least 30 were injured, officials said, some with what a doctor told the U.K. Press Association were "catastrophic" injuries. Police had said the assailant had killed four people, but later revised the death toll. Prime Minister Theresa May on Thursday described the attacker as a British-born man who had been investigated for links to extremism but was considered a peripheral figure. She praised the police but also the determination ordinary people who went about their daily lives in face of the attack. "It is in these actions - millions of acts of normality - that we find the best response to terrorism —a response that denies our enemies their victory, that refuses to let them win, that shows we will never give in," she said. The Islamic State claimed responsibility for the attack through its Aamaq News Agency, The Associated Press reported. 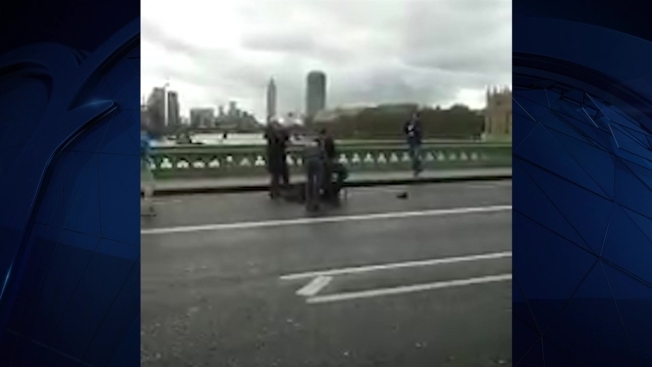 Eyewitness Matt Haikin thought it was an accident when he saw a crumpled car and a body on the ground on Westminster Bridge. That was before he saw armed guards running to the gates of British Parliament and heard gunshots. Four years ago it was al-Qaeda that prompted two men to murder a soldier near a military barracks in London. Lee Rigby, who had served in Afghanistan, was killed and almost beheaded in broad daylight as he returned to the barracks in May 2013. The attackers said his death was in retaliation for a foreign policy that was killing Muslims. 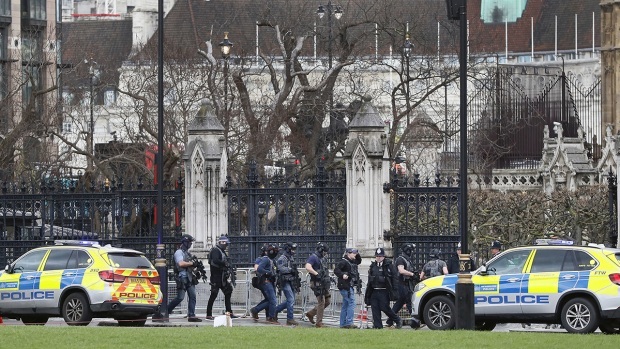 The threat level for international terrorism in the United Kingdom on Wednesday was listed at severe, and the city was on alert for the Thursday funeral of Martin McGuinness, the former Irish Republican Army commander turned peacemaking politician. The IRA conducted a bombing campaign against the British army for more 20 years beginning in the early 1970s, with multiple attacks in London and elsewhere, killing soldiers and civilians until Northern Ireland's 1998 peace accord. The IRA set off bombs outside the Old Bailey, in pubs, outside Harrods department store and in Hyde Park and Regent’s Park, among other sites. In 1984, it attacked a conference of the Conservative party, missing the prime minister, Margaret Thatcher, and in 1991 fired three motor shells at No. 10 Downing Street, the British prime minister’s official residence in London. British sangfroid was on display during the Blitz, the German air raids that killed 43,000 civilians and lasted for eight months in 1940 and 1941. According to the BBC, when the raids became very frequent, Londoners moved into newly constructed street shelters and even into Tube stations. The most famous would-be attack on the British Parliament occurred in November 1605, when Roman Catholic conspirators smuggled barrels of gunpowder into a cellar of the House of Lords. The Gunpowder Plot was discovered, and the best known of the plotters, Guy Fawkes — who was to have lit the fuse — was found, sent to the Tower of London and gave up the names of the others. Guy Fawkes Day, Nov. 5, is celebrated with fireworks and bonfires.